Explore photosynthesis and cellular respiration in beads formed of algal cells. Students can simultaneously explore both photosynthesis and cellular respiration using the same organism (an alga) in a simple colorimetric assay to yield qualitative and/or quantitative results. The experimental setup of the Photosynthesis and Cellular Respiration Kit allows students to track photosynthesis by CO2 consumption and cellular respiration by CO2 production. This kit aligns directly with AP Biology Big Idea 2 and connects to concepts in Big Ideas 1 and 4. The student and instructor manuals are designed to give teachers the flexibility to conduct the labs as structured, guided and/or open inquiry investigations. Ordering information: Kit contents include supplies for 6 inquiry labs. 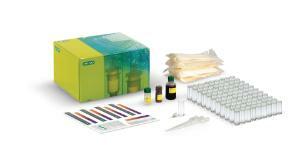 Algae beads; CO2 indicator; Debeading solution; Disposable plastic transfer pipets; Cuvettes and caps; Indicator color guide; Teacher guide; Student manual available as download. 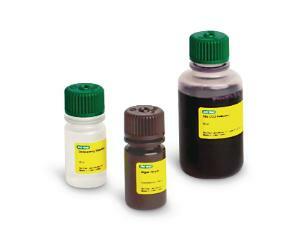 Refill kit is all of the reagents required to run the photosynthesis and cell respiration kit. Pkg. of 1, 170 algae beads, 50 ml 10x CO2 indicator, and 20 ml debeading solution. Caution: Notes: For education use only. Requires storage at 4°C.